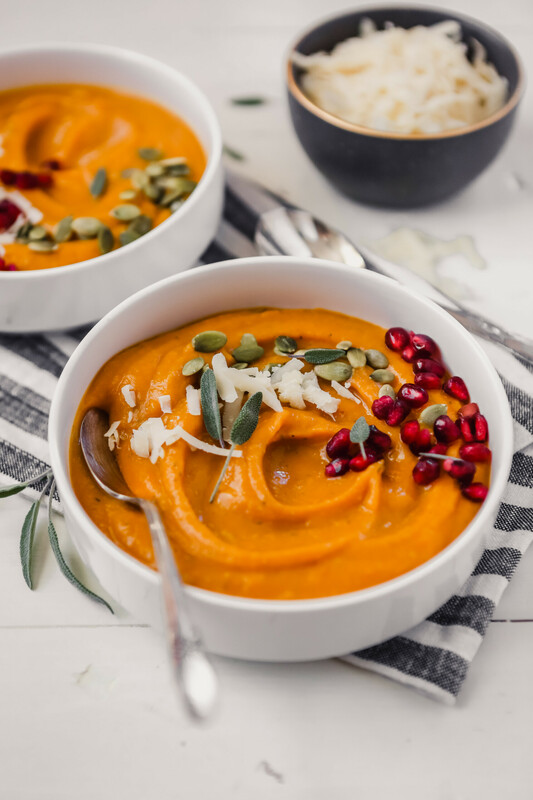 This creamy and luxurious soup is packed with flavor and healthy ingredients! Simple to make and incredibly versatile, this cold-weather bisque will keep you coming back for more. Can butternut squash bisque be frozen? And how long does it keep? Surprisingly it can be frozen! The soup will separate a bit during the freezing process, but once reheated it comes together no problem. The best way to freeze a bisque is to let it cool to room temperature then transfer to a glass container, press plastic wrap onto the surface of the soup, secure lid and freeze. Bisques will keep up to 1 week in the refrigerator or up to 3 months in the freezer. Let bisque thaw overnight in the refrigerator before reheating over medium on the stove top. What goes with butternut squash bisque? This cold-weather soup goes really well with any kind of vegetable side dish or warm, cheesy sandwich. Here are a few more ideas! There are so many great options for topping this creamy soup. Here are some of my favorites! 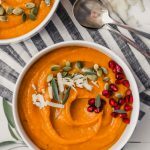 Is butternut squash bisque healthy? 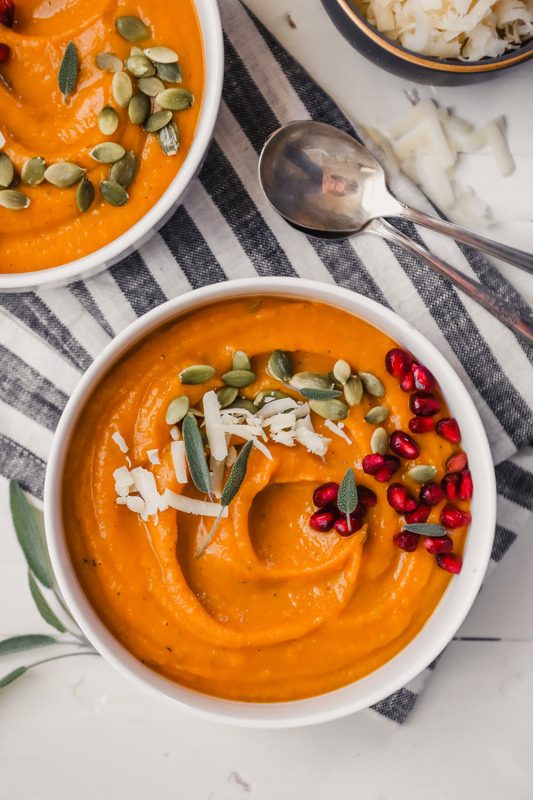 Although butternut squash itself is nutrient-packed, not all butternut squash soups are created equal. 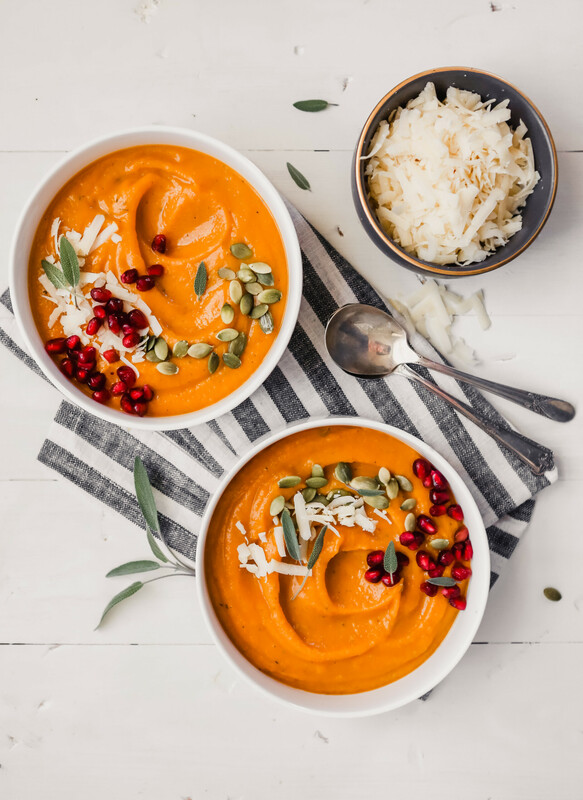 Many, if not most, butternut squash bisques and soups add cream to create a silky smooth consistency. And there’s no denying that cream absolutely makes a delicious soup. But this recipe doesn’t rely on cream for great flavor and texture. 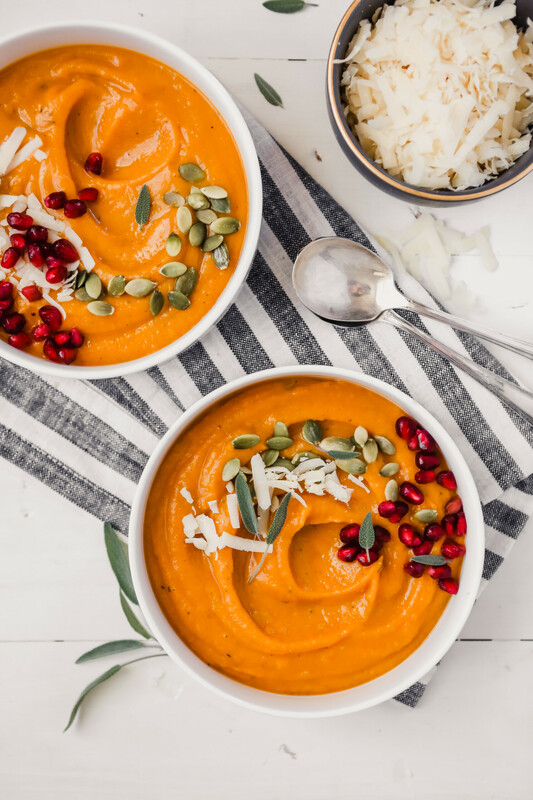 Instead, this healthified version relies on the cooked and puréed squash to create the silky texture. This recipe also employs the old Parmesan rind trick to adds a nutty, cheesy flavor without all of the extra fat. Simply throw in an old Parmesan rind (I freeze mine for moments like this) while the soup simmers, then fish it out and discard before puréeing. This recipe also uses apples for slight sweetness and added nutrients. Then fresh sage and thyme round out the flavors to create a soup that’s savory and satisfying. This recipe calls for milk as optional, and depending on preference or diet, you can use whatever milk you prefer. Of course if you want to use cream I wouldn’t stop you. 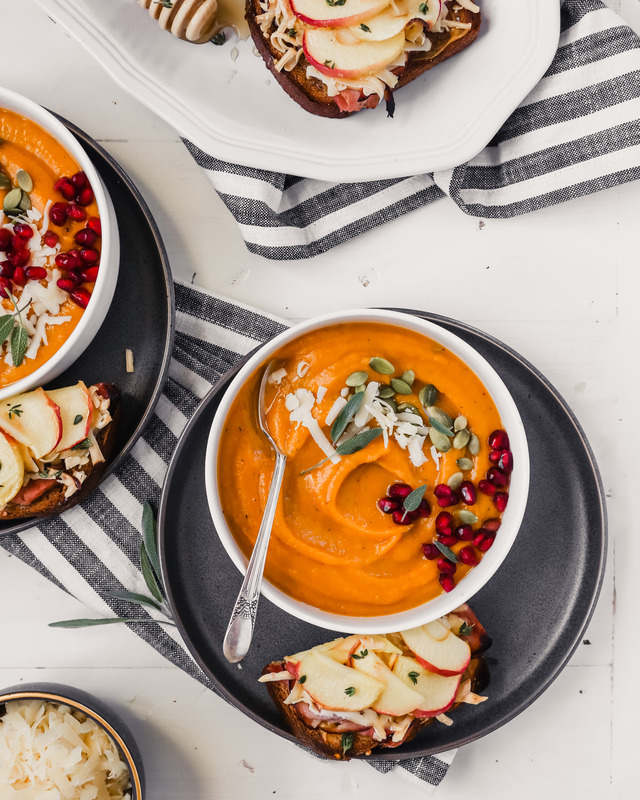 So to answer your question, is butternut squash bisque healthy? 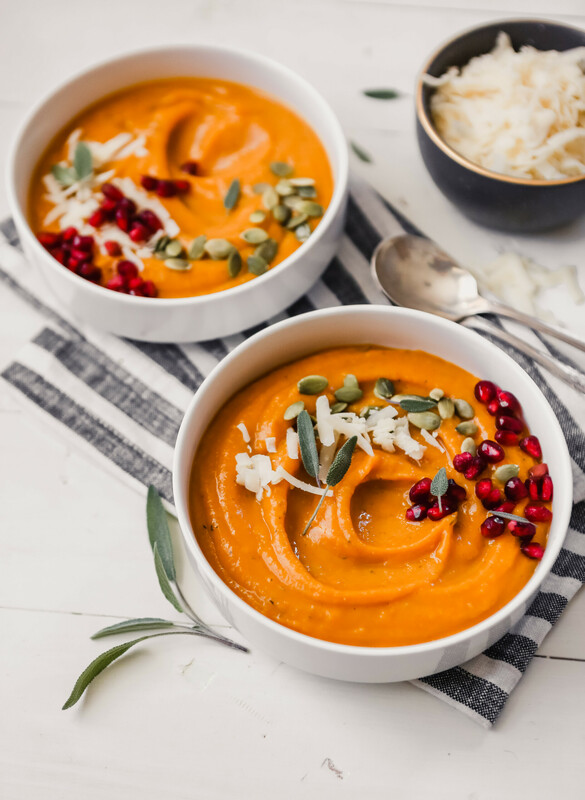 This version that’s packed with fiber, vitamins and minerals, and is low in saturated fat, is definitely a healthy choice. Just remember, bot all butternut squash soups are. In a large pot or dutch oven, heat olive oil over medium-high. Add squash, apples, and onion and sauté until beginning to brown and soften about 10 minutes. Add sage, thyme, and garlic and cook 1 minute; season with salt and pepper. Stir in broth, bay leaf, and Parmesan rind. Bring soup to a boil, then reduce to a simmer over medium and cover, cook 25-30 minutes, or until vegetables are softened. Remove soup from heat and discard bay leaf and Parmesan rind. Purée soup using an immersion blender or in batches using a standard blender. Return soup to pot over low heat, stir in vinegar and milk (is using); season with salt and pepper. Top servings with sage, pepitas, and Parmesan cheese. Rosemary would also be a great addition, add it in with the thyme and sage. If you have apple juice on hand, it’s a great way to pump up the flavor. Add about one cup when you add the broth. If you are puréeing the soup with a standard blender, be sure to cover the lid with a towel to avoid getting splattered with hot soup.